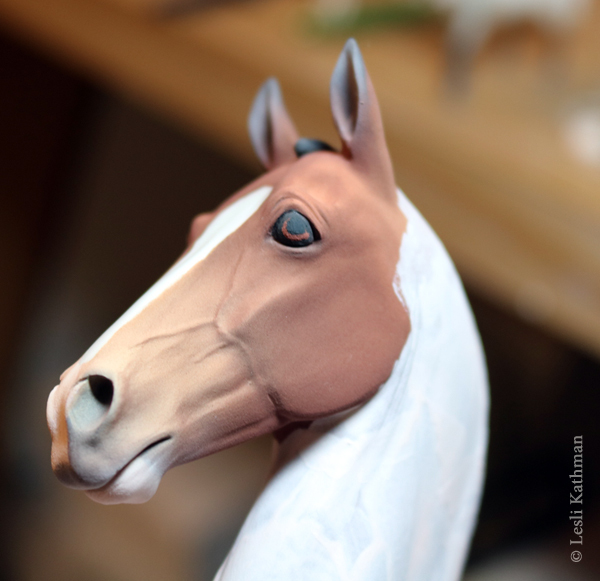 NaMoPaiMo – The finished horse! 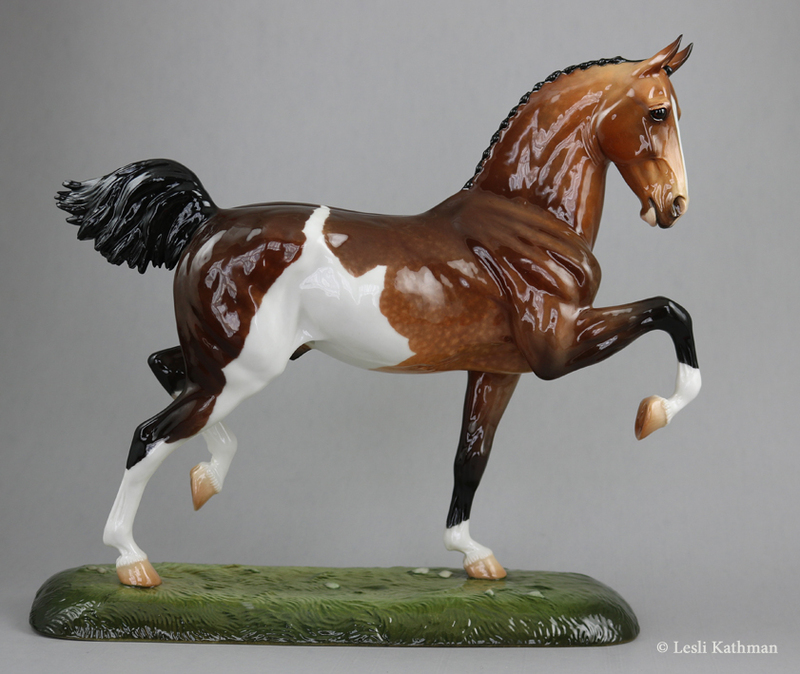 Here is the Hackney, fresh from his final glaze firing. I guess this means I did finish a horse in February, even if I don’t manage to finish the correct horse for NaMoPaiMo! I have had a few people ask about his unusual pattern. 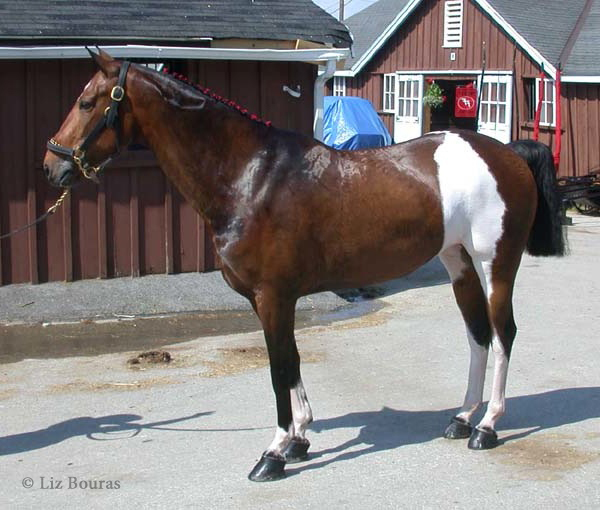 It was closely referenced to the first Hackney I encountered with this type of patterning, Heartlands Blizzard, who was photographed by my friend Liz Bouras at Devon. Since those photos were taken in 2002, I have seen more examples like Blizzard. 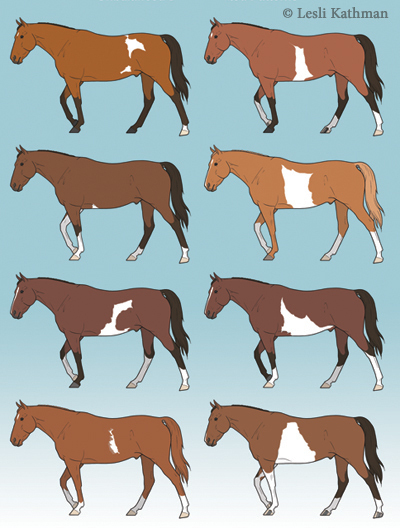 The first of the Equine Tapestry books had a (black-and-white) chart with examples. Here is the color version of that same chart for the upcoming second edition of Draft and Coaching Breeds (Volume I). As you can see, the outline and placement of this type of pattern is unusual. I have been looking for just the right mold for this, and I couldn’t resist the temptation of using it with this particular model! Now that this guy is finished, I am going to start at the beginning with another project. I am also at the same state in some traditional cold-painted projects, so it should be a good opportunity to post some comparisons. In the previous post, I had made the decision to add more color before I did the final firing. 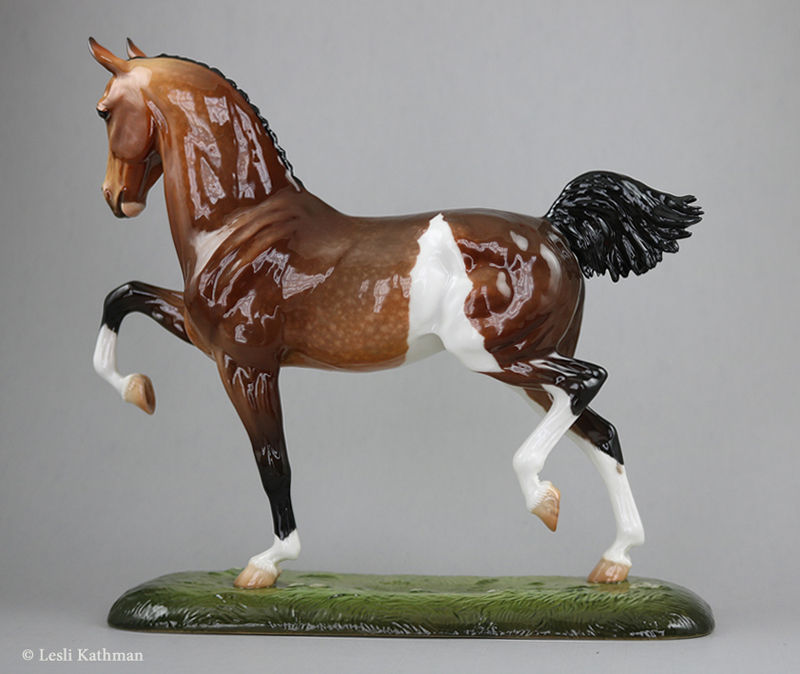 The face in the picture to the left is how the horse came out of the kiln. 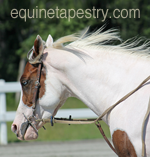 As you can see, the chalky red-gold tones have covered most of the dappling, and there is still residue of those colors on the mane bobs. The final color is not visible until the clear glaze is fired. If all the color has been fired, you can preview the final color by wetting it. That is what was done in the picture to the right. If you look closely, you can see the dry underglaze on his back, shoulder and ear tip. It is not the exact color, because those top layers are still more opaque (and more red) than they will be later, but if I can see the dapples clearly now it is a good bet that I haven’t lost much. Like a lot of things in underglazing, your eyes learn to translate what you see at this stage compared to what you are likely to pull from the kiln. 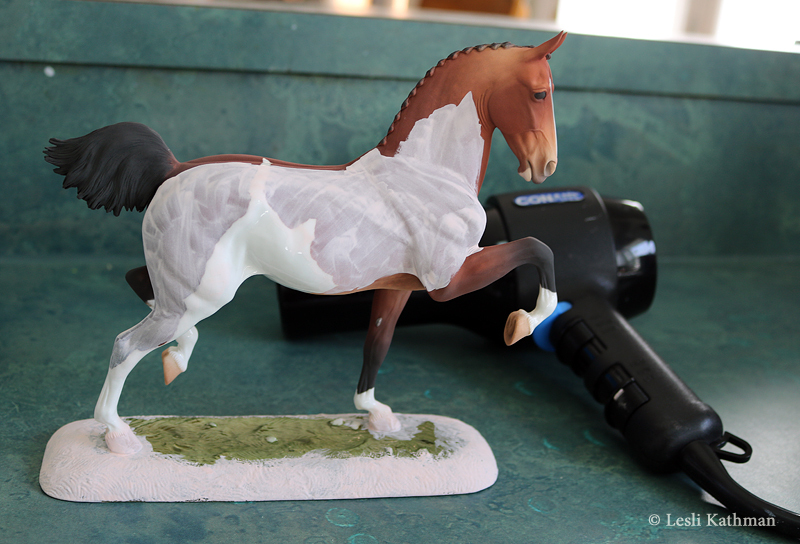 Since I am satisfied with what I believe will be the final color, it is time to add the clear gloss to the rest of the horse. I had already glossed the base and the white pattern, but the edges of the base were slightly rough to the touch. That happens when the glaze is applied too thin, so I have added another layer at this stage. Too much glaze can make an area cloudy, so it is better to err on the side of too little and add more at the end. I use the hairdryer between layers because wet glaze tends to lift, especially if the surface is bare bone china or already has some glaze. Any remaining details are done at this point. Here I have added a bit of color to the eye. This the same red-brown I used on the coat. Remember that I said this was a strong color, which makes it more stable than most red tones, but also makes it possible to muddy the dapples? Here I am going to use that to my advantage and paint a very opaque layer on the black eyeball. What I want is just a hint of brown iris that is visible at some angles, and the partial sinking of this layer will give that effect. I have also added some charcoal gray to the insides of the ears, which is visible in the picture as a pale blue gray. It will fire much darker, and will sink under the darker edges of the ear rims. I forgot to get a picture of the horse before he went into the kiln, but he was all-over pale pink except for the center of his base and his white pattern (which both already had enough glaze). I am a day behind with my posts, so I already know how he turned out, but tomorrow I will share him in his final form.